Margaret Rossiter's recent paintings are the end result of devoting decades to the loving and intimate observation of nature. This is a practice that serves to sharpen awareness and deepen respect for the sacred, interconnected web of life. Her paintings are an intense and passionate response to the natural world. 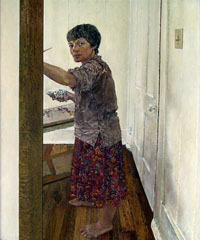 Margaret's subject matter ranges widely, and includes studies of the plants in her garden, landscapes of both Ontario and Massachusetts, and still-life paintings of familiar items around her home. The different genres are united by a naturalistic style, subtle handling of light and texture, and a rich treatment of colour and detail. Margaret Rossiter paints in a broad spectrum of sizes, primarily in oil. Inquiries should be sent to margaretrossiter@rogers.com.